Russia will press charges against White Helmets for crimes committed in Syria. The UK has resettled some 100 members of the White Helmets and their families who were evacuated from Syria, the Home Office has confirmed. The original language of the film is English, and it has been translated into seven languages with the aim of conveying a message to the West showing that some states were using the terrorist groups, and the so-called “White Helmets” and others to exert pressure on Syria at the Security Council. 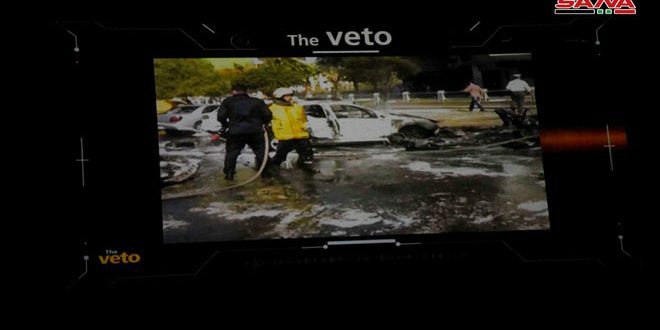 A political documentary titled “The Veto” by British Journalist Vanessa Beeley which sheds light on some secrets and details Homs City went through during the terrorist war waged against it was screened on Monday on stage of Homs Culture House. The documentary, filmed by Abdul-Mun’aim Arnous, exposes media lies against Syria through showing what had been plotted against the country behind the scenes, particularly in Homs City to be later displayed by the misleading Western and Arab media claiming that they are real. The documentary whose length is about an hour and half talks about the attempt by the West to use the Security Council as a tool to exert pressure on Syria, and to consequently form international groups to impose economic and military pressures on the country. The film also shows the reaction of the West which stood against Russia and China due to their stances in support of Syria and what it has done to preserve its sovereignty and territorial integrity. The film explains how events were fabricated to use them later against Syria, and it was screened at the Security Council and it was distributed among the journalists working at the council, in addition to screening it in Oslo. Sputnik: If we look at the case of Shamima Begum, a subject that's reached much controversy in recent weeks, reaction has largely been against her returning because of her terrorist links. Why have we not seen the same condemnation against White Helmet volunteers resettling back in the UK? Vanessa Beeley: This is the extraordinary thing I mean, here we have basically 100 Shamima Begums, who have been allowed into the UK and they're not even British — they're not British citizens. So this is complete hypocrisy on behalf of the British government but as I said, what it demonstrates, is that they are going to any lengths to protect what is effectively a British intelligence asset or propaganda construct that was created by a former MI6 officer James Le Mesurier in 2013 in Turkey and Jordan, not in Syria. So you know, yes — this has to raise the question again, why have 100 potential terrorist affiliates been allowed into the UK with no assurances? What evidence is there that the British government has carried out the cross checks necessary to ensure that they are not allowing terrorists onto British soil? 'Pseudo-humanitarianists': The Permanent Representative to the UN office in Geneva, Gennady Gatilov gives insight behind-the-scenes about the lobbying involved and Western nations promoting a very different line. 'Fresh money' for preparing the fake chemical attacks: Qatar Fund for Development is funding the White Helmets in Syria. The US is continuing to fund the fake chemical attacks in Syria. So you know, yes — this has to raise the question again, why have 100 potential terrorist affiliates been allowed into the UK with no assurances? What evidence is there that the British government has carried out the cross checks necessary to ensure that they are not allowing terrorists onto British soil? That's really a serious and logical question? I have checked European news outlets, including some UK and Canadian news sites, since it was first broadcast that some White Helmet's and their families were being accepted into the UK and other than the announcement, I have not come across another news article or report? No reports of one or more of these families moving into a neighborhood and the citizen's filing complaints or anything of that nature? It's like they disappeared? One thought - does come to mind, if these "100 potential terrorist affiliates" and their Families were transferred to the UK, and Canada for that matter, chances are that they arrived at a Military base and have been accommodated there? It would eliminate the need for the British Government to screen and cross check their credentials? Plus, I would think, some of these terrorist would be transferred back over to the Middle East or African Countries, as needed? Tahrir al-Sham al-Hay'at (the Levant Liberation Board or the Al-Nusra Front) terrorists in cooperation with White Helmets and European experts have dispatched new shipment of chemical substances to Idlib in line with preparations for launching a false flag chemical attack in a bid to accuse the Syrian Army, media sources reported. The Syrian foreign ministry condemned Washington's plans to allocate $5 million to White Helmets non-governmental organization in Syria as "desperate" and called on the United States to stop funding terrorism. The pro-militant White Helmets Organization in collaboration with the Western spy agencies are planning to carry out a fake chemical attack in Hama and Aleppo to later accuse the Syrian Army of the incident and annul the Turkish-Russian agreement. The source said that the aim of such provocative acts is defeating the plans to return control of Idlib to the Syrian government without any conflicts, adding that the plot was hatched after commanders of Tahrir al-Sham al-Hay'at (the Levant Liberation Board or the Al-Nusra Front), Horras al-Din and Turkistani terrorist groups rejected a Turkish-Russian plan to give in the control of Idlib to the Syrian government. The Russian Defense Ministry said on Friday that the secret services of France and Belgium were plotting to stage a false flag chemical attack in Syria to frame Moscow, as agents of the two countries were cooperating with terrorist leaders in Idlib. Militants, occupying large parts of the Syrian province of Idlib are readying a false flag attack involving chemical weaponry, the head of the Russian Centre for Reconciliation in Syria, Major General Viktor Kupchishin, said. The attack is being prepared in close cooperation between operatives of Belgian and French secret services and terrorist groups, including the rebranded Syrian Al-Qaeda offshoot – Tahrir al-Sham. Apart from them, the “pseudo humanitarian”, as the General put it, White Helmets group is also taking part in preparations. batch of poisonous gas, believed to be chlorine-based, has been already delivered to a number of villages in the Idlib province. The poison is packed in canisters disguised as oxygen and natural gas tanks, according to the Russian military. While the “actors” are offered some $100 for playing the roles of chemical attack victims, there’s a distinct possibility that the militants will poison people for real to make the video more “lifelike”, the official warned. The Tahrir al-Sham and White Helmets have fully prepared to launch false-flag chemical attacks in six spots in the demilitarized zone in Northern Syria.